Pretty much anyone who sets foot in this 4,000sqft Mid-Levels abode feels as if they’re being transported to a remote, tranquil land levitating above the infinite Mediterranean Sea—until they look out the extensive window, which enjoys a startling view of skyscrapers flanked by greenery that’s a simultaneous reminder of bustling Hong Kong. Hailing from Europe, the avid art-collecting couple who live here set out to create an ideal treasure trove to showcase their impressive art pieces. They’re new parents as well, so it needed to serve as a core base for their six-month-old son to revel in. Through word-of-mouth recommendations, they came across Hong Kong-based interior designer Peggy Bels who’s famed for her minimalist and clever takes on spatial design; it didn’t take long for the couple to realise she was the right person to curate their restful residence. “While the wife favours Victorian aesthetics and the husband is more about modern masculinity, we managed to blend their individual preferences with my signature approach for a space that perfectly satisfies all their requirements,” says Peggy. Anyone familiar with the designer’s work would instantly recognise her meticulous use of a monochromatic scheme, but this home is a far cry from her usual take – it showcases her versatile yet natural approach to various styles. 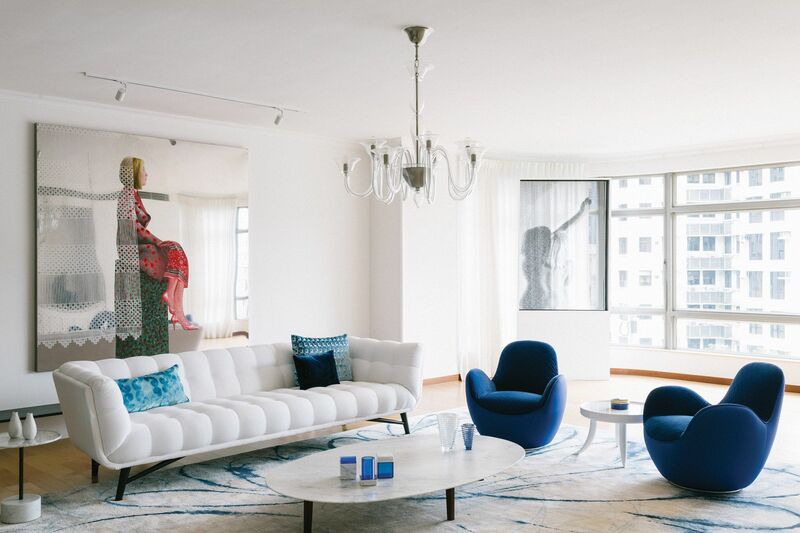 With this in mind, the white sofas from Cassina and Roche Bobois—in organic shapes and with exquisite details—were chosen to set a serene yet inviting background for the family to relax and the artworks to shine, flanked by two Roche Bobois armchairs in ocean blue. The couple initially planned to place a TV in the living area, but were pleased that Peggy eventually talked them out of it; the TV and audio system are now proudly presented in a functional family room at the other end of the home. Pulling all the different perspectives together in the main living area is a custom-designed rug adorned with blue brushstrokes from Fort Street Studio. Facing the tranquil scene is a customised cabinet designed by Peggy. She recalls, “It was originally a dark wooden wall that added so much weight to the space, so we decided to tear that down and create a niche with a clean white cabinet underneath.” Adding cohesion to the flow between spaces, the new addition ingeniously echoes the existing storage units, which mix old-world charm with sleek modernity. Hanging above the cabinet is one of the wife’s favourite artworks, an untitled piece by Greek artist Eleni Soumi that infuses a feminine touch into the spacious living area. Other art highlights include Park Seung-mo’s steel mesh installation Maya Nude263 by the window bay, Elena Papadimitriou’s Aniksiatiki Anamnisi, Wolfgang Tillmans’ Tasmanian Sea and much more. Walking up a few steps to the dining area, one is instantly mesmerised by Austrian photographer Christian Stemper’s Lupimaris on one side and Tillmans’ Schneckenstilleben on the other. The former encompasses 10 images that capture five fishermen and their boats. Towards the end of the astounding tour, the proud mother adds, “We’ve still got more paintings in our warehouse, which we refresh from time to time. By taking our son around to appreciate art from such a young age, hopefully it will help nurture his creative side.” With these beautiful furniture pieces and carefully selected art pieces in each space, it comes as no surprise that creativity runs deep in this family.